The City of Springfield parking ban will end as of 4:00 p.m., today, March 4, 2019. We thank you very much for your assistance and cooperation with this matter. A Parking Ban will be in effect beginning on Sunday, March 3, 2019 at 7:00 PM, until further notice. NO PARKING on the ODD side of the street from 9:00 A.M. through 4:00 P.M.
NO PARKING on the EVEN side of the street from 7:00 P.M. through 7:00 A.M. The Parking Ban includes all metered parking spaces. The Springfield Parking Authority provides parking when a Parking Ban Notice is issued. Snow Ban parking will be available at the Civic Center Garage for a fee of $2.00 every 12 hours. The parker must park on the 4th floor or higher. Do not park in spaces marked “Reserved”. There will be a yellow envelope left on the car for payment. The parker must put their spitter ticket in the envelope with payment and place envelope in the yellow box (located at booth) at the Harrison Ave. side when exiting the garage. Please note- the Civic Center Garage has a height clearance of 6’ 2” (six feet, two inches). Large vehicles or vehicles with roof racks are not able to park in the garage. If you need assistance from Security; call (413) 246-5757. The City of Springfield parking ban will end as of 9:00 a.m., today, February 28, 2019. We thank you very much for your assistance and cooperation with this matter. 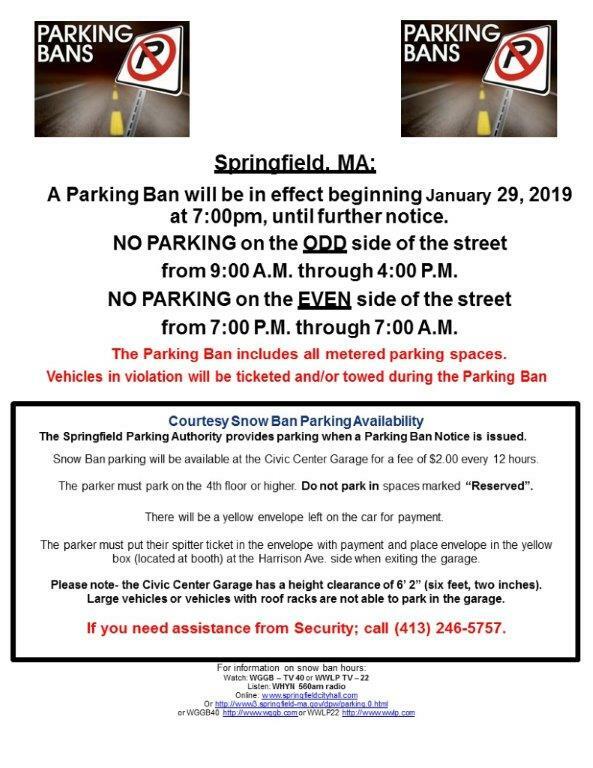 The City of Springfield will be enforcing a citywide parking ban as of 7:00 p.m. on Wednesday , February 27, 2019 until further notice. A Parking Ban will be in effect beginning February 27, 2019 at 7:00 PM, until further notice. The City of Springfield parking ban will end as of 4:00 p.m., today, February 13, 2019. The City of Springfield parking ban will end as of 4:00 p.m., today, February 13, 2019. We thank you very much for your assistance and cooperation with this matter. January 31,2019 – Springfield parking ban ended as of 9:00 AM. The City of Springfield parking ban ended as of 9:00 a.m., today, January 31st. We thank you very much for your assistance and cooperation with this matter. January 22, 2019 – Springfield parking ban ended as of 9:00 AM. The City of Springfield parking ban will end as of 9:00 a.m., today, January 22nd. We thank you very much for your assistance and cooperation with this matter.